I’ve made a habit before going on a trip to cruise around the online destinations section of newspapers to try to find one or two great articles that I can print out and bring along as a supplement to my guidebook for ideas and tips (which is what I did in Cartagena where I ticked off restaurants named in a recent NYT article — and never ate as well as I did that couple days since). This week the SMH enlisted the help of a group of insiders in Istanbul to share their favorite local spots around this not-quite Asian, not-quite Eurupean capital of Turkey — a must take-along for anyone heading there soon. Feeling thirsty and hoping to avoid the “crazy traffic and touristy areas of the old city?” Head to the Cinaralti tea house, a traditional tea house with sweeping views of the old city, or head to Fazil Bey’s Turkish coffee shop in Kadikoy Carsisi market where coffee has been served since 1923, filling the niche in this otherwise tea-drinking nation. Curious to shop in the “SoHo” of Istanbul? Head to Galata-Beyoglu, the chic shopping destination home to Laundromat Boutique, where you can check out the future of Turkey’s design and fashion. For the full guide and other tips click through here. Nowhere deserves the title of European capital of culture more than Istanbul, writes Jan Morris, while insiders reveal their favourite places. 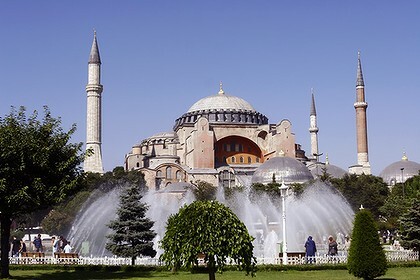 ‘Culture” is a flexible conception but if you interpret it to mean the whole range of human experience and achievement, then nowhere is better qualified to be the cultural capital of Europe than Istanbul, nee Constantinople. It even looks the part. In all European travel there is no spectacle more tremendous than the sight of Istanbul massed beside the sea – a solidification of history, jumbled houses and docks and palaces along the shore, mighty domes and soaring minarets, ships and ferries swarming everywhere, rumbling traffic over bridges – a timeless metropolis, familiar to travellers for a thousand years and of such consequence that for centuries it was known to half the world simply as “The City”. Technically it is, of course, only debatably European at all. It is the chief city of republican Turkey, which is not yet a member of the European Union, and it is as monumentally a western gateway of Asia as it is an eastern portal of Europe. The moment travellers step ashore in Istanbul they know they are in a city sui generis, partly familiar, partly marvellously exotic. It has been in its time pagan, Muslim, Christian and officially secular. 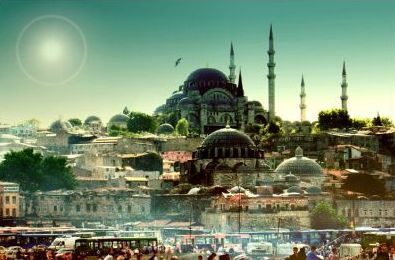 The most celebrated of all its monuments, Hagia Sophia, began as a church, became a mosque and is now a museum and to my mind this overlapping of civilisations makes it all the more suitable as the cultural capital of a continent becoming inexorably more various as the generations pass. But still the fascination of the magnificent old place is its Turkishness, the ultimate patina (so far) that covers its successive layers of historical memory. Nowhere in Europe is more suggestive than the rambling enclave that is the Topkapi Palace, where once the Ottoman sultans held court, where the harem gossiped and the executioners sharpened their blades and from whose gardens you can look out across the fateful waters of the Sea of Marmara and the Bosphorus. No refreshment break is more satisfying than a cup of thick coffee and a sweetmeat taken at a table beside the Golden Horn, frequented by seafarers since the days of Homer. You can imagine in these streets the imperial legionaries of Constantine himself, the janissaries of Islam, looting Christians from Venice on their way to the Crusades, merchants from all the nations setting up their stalls in its famous markets. Hasircilar Carsisi (Strawmat Weavers Market), Eminonu. Serdar Ekrem Sokak 52, Karakoy. Jason Goodwin is the author of Lords of the Horizons: A History of the Ottoman Empire and of the Yashim series of novels.